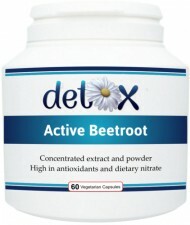 A highly concentrated and powerful combination of beetroot active (0.3% betanin), beetroot extract (10:1) and beetroot powder. High in betanin (Beetroot Red) antioxidants, dietary fibre, vitamins and bioavailable forms of non-irritating iron and trace minerals, these beetroot capsules are food state for maximum absorption and utilisation by the body. Particularly popular with athletes, beetroot contains high levels of dietary nitrate, thought to promote the formation of nitric oxide in the body and thereby support performance, stamina and endurance during exercise. It also contains folic acid, essential for normal tissue growth. Contains the mineral silica, which helps the body to utilise calcium. Virtually fat free and low in calories. 1 capsule, 1 - 3 times per day or as advised by a health practitioner.